Ricky Pope, a student at Miami Nortwestern is overcome with emotion while talking about his classmate who was killed. 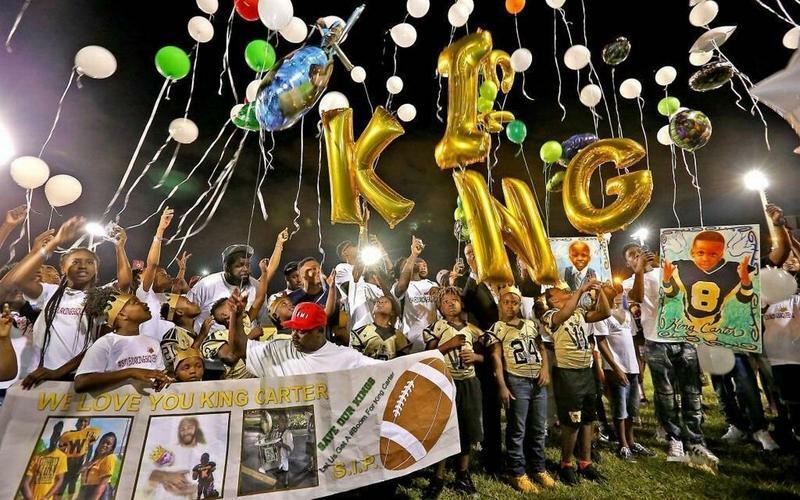 The students at Miami Northwestern High School left their morning classes for an outdoor tribute in memory of Kimson Green, a sophomore at the school who was killed in the Liberty Square Housing project Sunday. The media and community members were not allowed to attend the on-campus tribute, but word got around via text messages and social media that the students were planning a walkout and people showed up to support them from outside the school gates. Kimson Green was an honor roll student who was set to be inducted into the National Honor Society in May. His teachers described him a sweet young man who didn't like to settle for B's on his class assignments. His life was cut short Sunday afternoon while sitting in front of an apartment with his friends. Another person was killed, and two were injured in the afternoon shooting. Police say they have no motive in the shooting and no arrests. 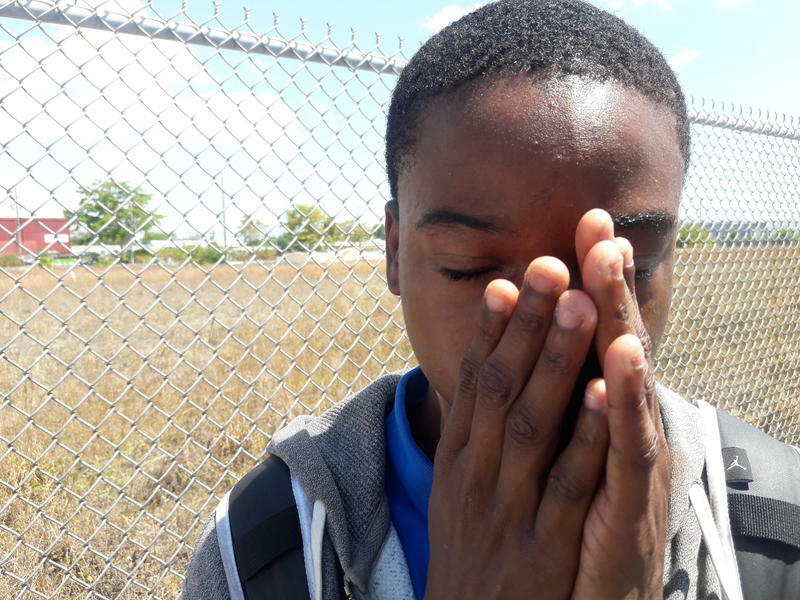 Ricky Pope, a junior at Miami Northwestern said news of the sophomore's death rocked the student body. Ricky was one of the students who attended the March For Our Lives rally for gun reform in Washington D.C. hoping to learn more about youth organizing and activism. He didn't expect to have to put those skills to use just weeks later. "It's so many lives that are lost every day," he said as he brushed away tears from his cheeks. He said the student body at Northwestern wanted to make sure they showed up for one of their own as they process losing yet another classmate. During Ricky's freshman year, four students at the school were killed by gun violence. "We called a walkout... for the Parkland kids, I’m like, 'What! we did a walkout?' he said. "But my ninth grade year kids died and we got a moment of silence." 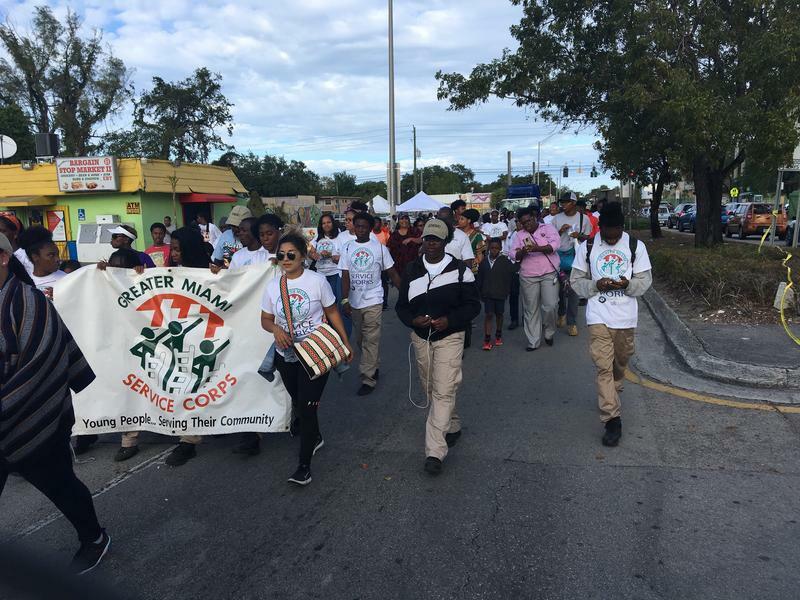 "We need preventive services, intervention programs, grief counseling for families, updated programs for all youth." Outside of the school there were several TV news vans, but they couldn't capture the kids walking out to the outdoor area where the school's band played, students and teachers gave impassioned speeches and where many, overcome with emotion, wept openly and held on to each other. Wallace Aristide, the school's principal said he wanted to create a safe space for the students that didn't involve taking to the nearby streets or sidewalks. "I told them we would create a venue if they wanted to do it on campus, so we created a venue," he said. "And they did leave their classes. They were on campus. They were able to express themselves." Aristide said Kimson's death hurts his students and it hurts him. "Once you do this job you build a relationship with students and students are your family members," said Aristide. "And when you have a loss of a family member, it's painful." Danny Agnew, a community activist with the Dream Defenders, shouted encouraging words to students through a locked chain link fence. "Let ya'll voice be heard. We know ya'll tired," he yelled. "We got your back." Izeria Roberts also stood outside the gate with one of her daughters who attends Miami Central High School. She said she heard there was going to be a public rally at the school. She hoped her daughter, who went to middle school with Kimson, could grieve with other students. Roberts pleaded with a school security guard and administrator to let the students who want to walk out to do so. "Why ya'll lock them in?" she asked. "They’re hurting they lost a friend. Let 'em out." Tangela Sears, an anti-gun violence activist showed up after students texted her that they weren’t allowed to leave. Sears said she tried to convince school administrators to let the kids come out to the front of the school — where the TV cameras were set up. "They have a right to walk out here and stand here to make a statement cause they’re tired of being tired," she said. "It’s a painful thing to go back in the school and see children on the ground crying because that’s their friend that got killed." Mount Calvary Missionary Baptist Church is sandwiched between a police station and a housing project in Miami’s Liberty City neighborhood. Dozens of families over the years have filed into the church’s sanctuary to say tear-filled goodbyes to children and teens killed by gun violence.